If the navigation pane in MS Explorer was accidentally disabled in the Windows Explorer 8.1, the directory structure can be quite easy to become visible again! Please start the File Explorer in Windows 8.1 [Windows-Logo] [E] and click View and now on navigation pane! 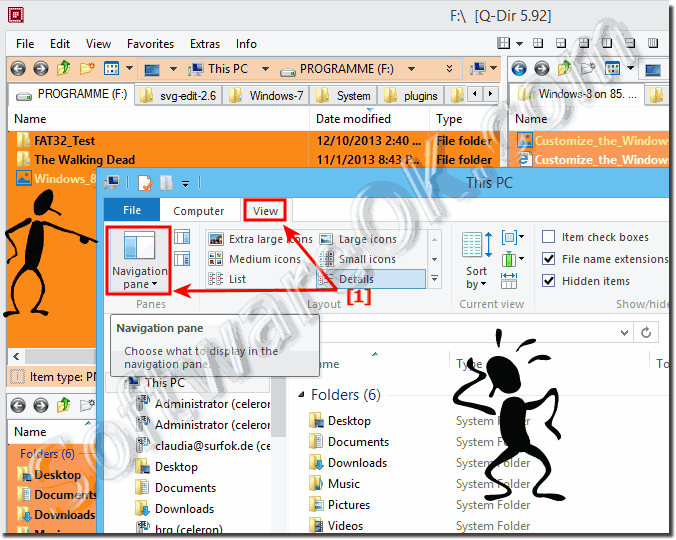 (Image-1) Activate or deactivate Navigation pane in Windows Explorer! When you open a folder in Windows 8.1, you can change how the files look in the window. For example, you might prefer larger or smaller icons in MS-Explorer or a view that lets you see different kinds of info about each file. To make these kinds of changes, use the View tab in Windows 8.1 Explorer. Windows-8 - FAQ-185: Show navigation area eg directory structure in Windows Explorer in 8.1 and 8! Windows 8.1 default directory structure? Windows Explorer 8.1 without tree structure? Show Windows 8.1 directory structure? Structure of folders Windows 8.1? Folder structure diagram in windows 8.1?